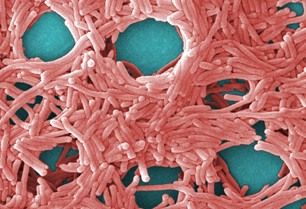 Legionella are a group over 40 species of small, rod-shaped bacteria responsible for Legionellosis. The most common species present in human infections is Legionella pneumophila—pneumophila is latin for “lung-loving”—found worldwide in a variety of natural and artificial water sources. These infections can occur in two forms: the milder, flu-like Pontiac Fever, or Legionnaire's Disease, a potentially fatal form of pneumonia. Legionella thrive in water, especially warm water, and have been found in natural sources and homes, cooling towers, fountains, spa pools, hotel water systems, ships, factories, and respiratory equipment. Pontiac Fever (febrile illness), is the less-severe, flu-like form of the infection, characterized by fever, chills, headache, and muscle pain. This infection typically clears within 2 to 5 days. Legionnaire's Disease is the more severe form, involving pneumonia. Its symptoms are nonspecific, but the infection has a rapid onset and can be fatal. Legionella can be effectively treated through heat and flow-rate management, ultrafiltration and ultraviolet irradiation.